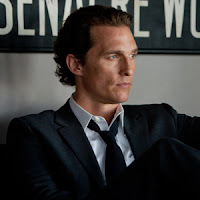 In what plays as an extended TV pilot - Matthew McConaughey does what he does better than anyone else in ‘The Lincoln Lawyer’ - play Matthew McConaughey. This time out as yes, a lawyer who could double as from the one he played in his first major role ‘A Time to Kill’. He’s clearly the star of the show which buckles at times under the weight of its far-reaching plot plausibility. Entertaining but never rising to a level that warrants a “must see” - ‘The Lincoln Lawyer’ is perfect for a viewing when it inevitably shows up on TNT - which ironically - would have been the perfect spot for its debut.